I’m obsessed with mirrors and vintage candle holders. 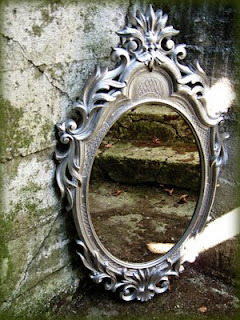 I’ve been searching for a nice mirror for my formal living room for ever, I didn’t find what I had in mind ( it looks that what I had in mind is either so rare either so expensive) so I settled for something else :). – First I removed all the staples in the back with my professional tools, to remove the mirror form the frame. – Second wipe of dust from the frame so the spray paint will stick. – Third just use your favorite spray paint color mine is “Rustoleum Metallic Silver”, and to get a smooth finish spray two light coats. – Fourth reverse step first, put back the mirror to its place and staple it. IF YOU ENJOYED THIS POST PLEASE ADD ME TO “FOLLOWER” LIST. I’M GROWING MY FAN LIST. The mirrors came out great !!! Paint has become my best friend. Sorry you wiped out your comments … I'm bound to do something like that …until I have a better idea of what i'm doing here in blog land. I love your mirrors…they turned out great! I have been trying to find a good round one too with an ornate frame…not so easy to find. I love mirrors, too! And paint can do wonders. Thanks for the inspiration. hi rasha. nice blog you have here, and thanks so much for visiting mine! your mirror redo is really pretty. 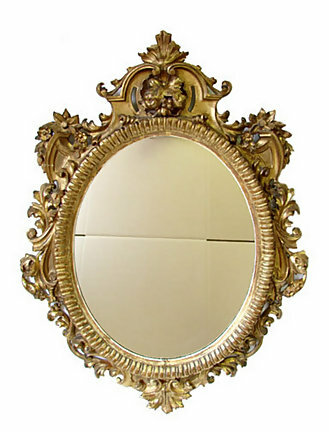 I agree, people seem to find stuff very cheap..I have a mirror like your rectangle one, it was 25$ and I thought that was a steal! it looks so glamorous and chic and fits perfectly with your vignette! Well done Rasha, and thanks for the lovely comment on my similar project. Keep searching, I know you can find the perfect kind of mirror that you're looking for (although this one looks pretty great too)! This is so pretty. I've always loved silver and the set up is so glam. I am not sure how I made it to your blog. I started at Design It Chic to ? to Santa's Gift Shoppe to here. I would love it if you followed back. Hi I came here by way of Miss Mustard Seed and have followed, I can't wait to see what you do next. I never thought I liked gold and silver all that much but you have a style that I love, it's like the modernized version of old hollywood regency…anyhoo, I wanted to tell you that IKEA has a frame that is closer to what you were looking for in your mirror, it's the only ornate oval frame they had last time I was there, it was $29.99 and black, so you'd have to paint it and get a mirror insert, but it's not the far off from what you were looking for. Keep up the inspiration…now you've thrown me a curveball…how do I blend Miss Mustard Seed style with yours? I am a new follower please visit me at Hibiscus House anytime. I am very much pleased with the topic you have chose for. I enjoyed every little bit part of it. Wow the result is amazing! Thank you for sharing the knowledge of spray painting! It is very helpful and informative as this can give some insights for spray gun lovers out there. Would love to see more. This is very informative post! Thanks for sharing. Paintings of art can likewise be performed on different mediums, for example, auto hoods and motorbike fuel tanks to cite two cases, yet all in all you'll see craftsmen making magnum opuses on paper. Jodie Fitz on How To Organize Your Pantry. Judy on How To Organize Your Pantry.